(11/16/15) International Film Festival for Spirituality, Religion, and Visionary (IFFSRV) was held again. This festival who focuses on theme of tolerance, religion, spirituality and visionary held its Awards Ceremony and The Celebration of World Tolerance Day in Auditorium Abdulrrahman Saleh, Radio Republic of Indonesia (RRI), Jakarta. This event was full with filmmakers from all over the world, society, actress/actors, artists, official governments. Hundreds of films from all over the world submitted their film to this festival since this festival opens its submission last year. Damien Dematra, the founder and director of IFFSRV, said, with lots of films about tolerance and spirituality that were submitted this year shows that there’s still a lot of filmmakers who cares about tolerance and would like to show it through creative works. He also hope that this festival can bring people from different backgrounds to create a peaceful environment and a world of tolerance. In the event of World Tolerance Day it was also launched the album of Natasha Dematra called "Cinta Untuk Semua”. This album brings a lot of tolerance theme in it with a purpose to create a better world and a world of tolerance. “Differences are beautiful and has to be appreciated,” said Natasha firmly. She hope, that this new album of hers will inspire people who heard it and can make people appreciate differences and act with tolerance. At the end of this Awards Ceremony was announced the Best Film of IFFSRV. The winner gies to Pilgrimage directed by Mariel McEwan, who receive Production Fellow from American Film Institute. Pilgrimage is a beautiful and unique piece of film that mix dances and spirituality of balance. This film brings the audience to see the nature beauty of Sawtooth Botanical Garden. IFFSRV works together with other international film festivals, Filmmakers of The Year Film Festival (FOTY), International Film Festival for Documentary, Short and Comedy (IFFDSC) dan International Performing Arts & Movie Awards (IPAMA) and International Students and Newcomer (ISENMA). 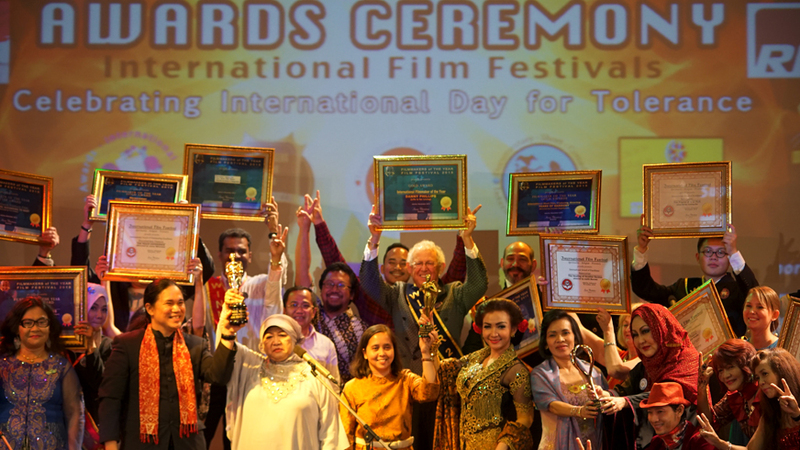 This event of Awards Ceremony that held on 16th of November 2015 was open by The Advisor of People’s Creative Council, Lily Wahid and Chairman LPP Radio Republic of Indonesia (RRI), Dra R Niken Widiastuti, M.Si, and King and Queen of Pakualaman. The festival was made possible by Indonesia People’s Creative Council with cooperation with iHebat International Volunteers, The University of Indonesia, Care for Children Foundation, World Film Council, several High Schools and Radio Republic of Indonesia (RRI) as media partner and organiser. The winners film of IFFSV and other partner festivals would be screened in RRI, several high schools in Jakarta and Bekasi, The University of Indonesia and other places starting from November 16 until December 1 2015.